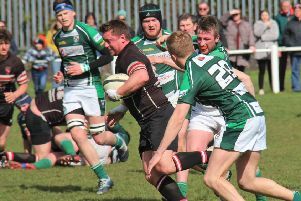 Old Crossleyans were unable to produce the free flowing rugby of the previous week’s opening victory against Roundhegians and were beaten 17-13 at Yarnbury on Saturday. They managed to salvage a losing bonus point with the last play of the Yorkshire Two game, reward for a strong defensive performance. Yarnbury had the lion’s share of territory and possession and created more scoring opportunities. Crocs’ lineout was misfiring and the scrummage was under pressure on several occasions. Crossleyans took the lead with a Gareth Sweeney penalty after five minutes when a Yarnbury player went off his feet at a ruck. There followed a flurry of penalties to the home side as they set up camp in the Crocs’ half. The defensive line held firm but Crocs were offside and Yarnbury knocked on with the try line beckoning following a tap penalty. Yarnbury kicked astutely behind the defensive line but James Wainwright regathered close to the try line and enabled Joe Gallagher to clear to touch. Minutes later, a wild pass from Yarnbury was seized on by Gareth Sweeney who sprinted down the left wing. When the ball was eventually recycled Yarnbury were offside in front of the posts and Sweeney made it 6-0 on the half hour. The hosts came back strongly. Crocs conceded successive penalties and had a man yellow carded. Yarnbury took the scrum option close to the line but excellent defence again forced turnover ball. However, the pressure finally told when wingman Gomersall,shook off the attentions of several defenders to score an unconverted try in the corner. The first notable action of the second half saw impressive Yarnbury fullback Davies scythe through the midfield to be held up just short of the try line. His off-load found a Crocs’ defender who cleared. The home side spurned another chance when a looping pass in a back line move was knocked on. Their back row forward Cryan then burst through but had no support. Crocs responded impressively with Ryan Hammond And Oli Coyne punching holes in the midfield. When Yarnbury counter attacked Scott Caley was alert to the danger and cleared long downfield. Midway through the half Yarnbury had a ‘try’ ruled out for a forward pass and this signalled another spell of dominance. They were held up just short of the try line but when the ball was eventually thrown wide, Davies scored in the corner. The conversion was missed but Yarnbury led 10-6 after 62 minutes. Crocs had another player yellow carded and from the penalty lineout Yarnbury mauled their way over the line, Tennant being credited with the try. Davies’ conversion stretched the lead to 17-6. Entering stoppage time Wainwright and Lewis Sharpe combined to sprint into Yarnbury territory. Yarnbury had a man yellow carded but defended strongly and Davies cleared. There was still time for one last drive. Caley was held up just short but Cameron Brannan buried his way over the try line between the posts and Sweeney converted. Next week’s opponents are Ripon, who visit Broomfield to contest the Albert Gibson Memorial Trophy. HALIFAX Vandals were beaten 25-18 at West Park Leeds in Yorkshire Two.